Views on the HUGE move by Lebron James from the Cleveland Cavs to the Los Angeles Lakers at “Sports Inner City Online” www.sportsinnercity.com NEW “Sports Inner City:Off The Court” webcast soon. Check out the latest “S.I.C-TV” webcast right now! Ladies and gentlemen and FB friends I am a big man. But I like all of you I have feelings. Feelings of being happy and feelings of being sad. I talked about some of my feelings of depression in a earlier blog after the terrible terrible passing by suicide of the man who produced my favorite TV program Anthony Bourdain. But their is another story that has me feeling very sad. 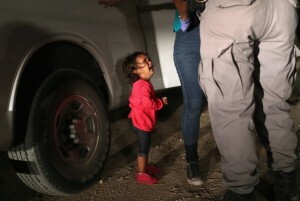 And that is the little babies and kids being taken from their parents down in southern Texas. It is a very very sad and emotional situation. Republicans and Democrats are blaming one person and one person only…Donald (I will not call him President) Trump. No one else I can blame for this other than Trump. Period. This dude needs to be impeached immediately. What is going on at the Texas/Mexico border is a outrage and Donald Trump is the reason. Trump is a so called man who tells LIE AFTER LIE AFTER LIE AFTER LIE! He has a “zero tolerance ” rule in his mind that is separating little kids and babies from Mexico and other countries who left a situation that included gang violence and much more for a better way of living in America. Agents at the border have always done their jobs. BUT their jobs are much different under Trump than it was under President Bush 1 and 2, President Clinton and President Obama. 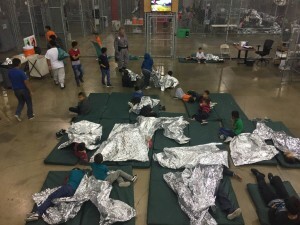 Kids are being taken from their parents to be in basically cages. Yes they are giving them three meals a day and a shower etc. But their is one HUGE problem. The little ones are taken from their mom and dad. THIS IS VERY VERY WRONG!! THIS IS AT THE FEET OF DONALD TRUMP. To make matters worse Trump is blaming the Democrats & is saying the Democrats do not want to stop the gangs from coming into the United States, do not want to stop drugs from coming into the United States and more. He REFUSES to look in the mirror at himself. Trumps own lady came from another country for goodness sake. She had to file papers to be a American! I have watched the tape of little kids crying at a border building after being separated from the parents. It had me crying ladies and gentlemen and I am a big fella. It is very very sad and very very wrong. And does Trump care? HELL NO!! He is double ling down and even triple-ling down in saying he refuses to let MS-13 gangs in the U.S. and drugs in the U.S. and he says he refuses to allow families to enter the U.S. illegally. But their is no law folks for him to separate families. NO LAWS!! It is a Trump made law of zero tolerance. Trump can end this no tolerance BS TODAY!! But he refuses. He continues to want to separate kids from the parents. And Trump is using RACIST TERMS LIKE FAMILIES ARE COMING INTO THE U.S AND “INVESTING” OUR COUNTRY!! Yes he used the word “INVESTING” This is unacceptable! First Ladies Obama, Bush, Carter and even Mrs. Trump are speaking up in behalf of these poor kids being taken away from their parents. Laura Bush has barely spoken out on anything in the past BUT she is making her voice heard on this and this is great! What REALLY bothers me is empty headed puppets like Kellyanne Conway and Mike Pence and Sean Hannity, Steve Cortes and others getting on TV and taking up and supporting Trump. This is just beyond stupidity readers!! I am watching Cortes blaming the parents!! Steve Cortes needs to put the crack pipe down. He is a very very mixed up so called human being. I wonder how much Trump is paying this fool. Ann Coulter another Trump puppet said the kids from South America etc are “child actors” WHAT KIND BS COMMENT IS THAT!!!! But I am glad to see a few Republicans going against the clown Trump and they are speaking up too. But their needs to be many many more speaking up! It is time for the clown Trump to stop blaming the Democrats. Trump is saying he will cut aid to countries who allow “bad people” to leave and try to enter our country. What kind of BS is this? Unbelievable! It is time for Trump to stop blaming a REAL President in President Barack Obama for EVERYTHING!! Trump HATES Prez Obama and still thinks he was born in Kenya!! Kellyanne Conway and Sarah Sanders and Pence and the Homeland Secretary should should be on Air Force One with Trump. Ladies and gentlemen this situation regarding these children being taken from their parents is one of the worst things I have ever seen. With a buffoon in Trump using words like “invested” etc. And blaming Democrats for bringing in MS 13 gang members and drugs. This guy is STILL bringing up the freakin elections and how he won over Mrs. Clinton. This is just CRAZY!! What Trump is doing is all about his CRAZY wall at the border down in Texas/Mexico. A wall that will never get built. Mexico said they will not pay one cent for a crazy wall. But Trump keeps talking about it. Meanwhile kids are not with their parents. And I am glad to see companies like Facebook, Boeing and Google taking a stand against Trumps policies on taking kids from their parents. In my opinion and many others, their are people that need to step down or be removed from their jobs because of this. People like Kellyanne Conway, the Homeland Secretary Kirstien Nielsen and others should STEP DOWN IMMEDIATELY!! Nielsen for sure should step down. Watching these kids in cages like animals hurts me big time. It should hurt you too. All because of of a man who has never experienced being poor and down on his luck. Trump and his kids were born with a silver spoon in their mouth. Here is another thing readers. Trump should hop on Air Force One and visit South Texas and the see the cages these kids and families are staying in. Why doesn’t he do that!!! Nielsen has no idea what is going on. She could not even answer questions the other day. Just plain wrong!! She gets in front of cameras and talks about the kids that are taken away from their parents are having good meals, taking showers, playing video games and watching movies and more. GIVE ME A DAMN BREAK!! THESE KIDS ARE NOT WITH THEIR PARENTS!!! What will happen next to the children and parents separated from each other who knows. All I know is Donald Trump and family are sleeping well at night. Unlike little kids who are taken away from their parents. A truly sad story. But guess what readers? Trump always has buddies at the voice of the Republican Party…Fox News to run to and tell his crazy opinions!! Erykah Budu Should Have Put R.Kelly On Blast! !